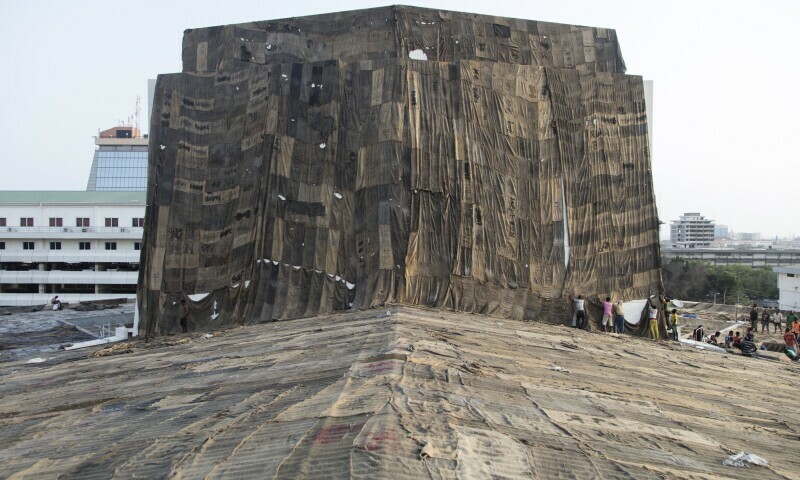 Ibrahim Mahama, Malam Dodoo National Theatre, 1992-2016, National Theatre of Ghana, Accra, 2016. Ibrahim Mahama's (born Ghana, 1971) practice, predominantly focused on installation and architectural interventions, questions Africa's role in the global exchange of commodities and the way labour is valued. This is suggested by the materials Mahama employs, such as hessian sacks that bear traces of cocoa production and used shoe shine knits. Norval Foundation has invited Mahama to create a site sensitive work.